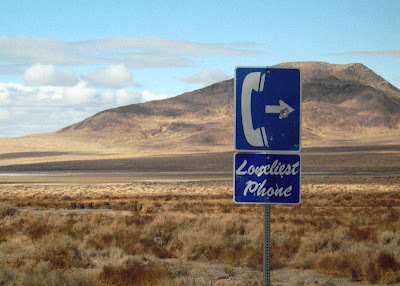 ...the loneliest phone in America - or at least the sign for the loneliest phone - was in plain view on Highway 50 on the side of the road. The two photos above were taken on April 30, 2007. 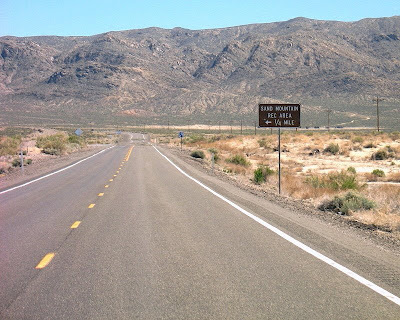 This photo of the sign on the east side of the Sand Mountain turnoff was taken on December 28, 2006. The sign is a bit shot up, which is a fairly standard thing in Nevada. 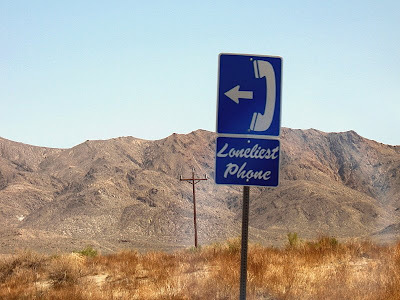 I have no photos of the so-called loneliest phone, but you can read about it here and here, and see a great photo of it here. It is described as a microwave, solar-powered phone. By April 12, 2008, the signs and phone were both gone. The phone was removed by the phone company, according to this site, for getting shot up by passing drivers and Sand Mountain recreators too many times. I don't know exactly when the phone disappeared, and I never made a call from it. There are, or have been, phones and phone booths farther out in the middle of nowhere - and probably far lonelier, given that Sand Mountain is a major recreation area near Fallon and is only about 1.5 hours from Reno - including this now-gone loneliest phone booth near Cima Dome in the Mojave Desert of California. We are back at Lone Mountain again (the Lone Mountain in central Nevada), this time looking straight down on the mountain via two slightly enhanced Google Earth images (click to enlarge). Op: The mostly Ordovician Pogonip Group carbonates, mostly limestone, as defined by Nolan and others (1956). 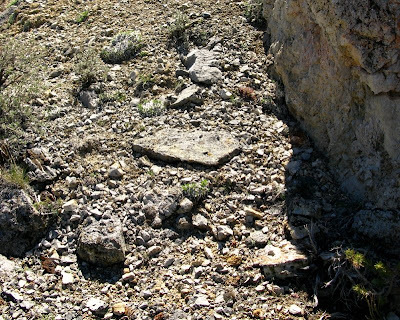 At Lone Mountain, only the early to middle Ordovician Antelope Valley Limestone is present. Oe: The middle Ordovician Eureka Quartzite. 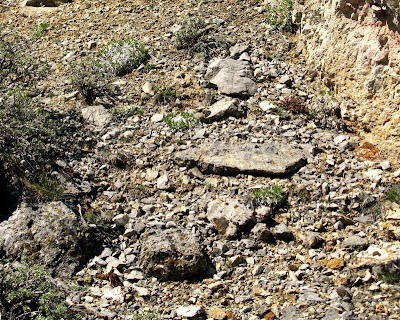 SOh: The middle Ordovician to early Silurian Hanson Creek Formation, which at Lone Mountain consists of 318 feet (Merriam, 1940) of “medium- to dark-gray dolomite and dolomitic limestone” (Nolan et al, 1956). Srm: The mostly Silurian (early Silurian to early Devonian) Roberts Mountains Formation has a total thickness of about 740 feet at Lone Mountain. It's basal black chert bed, 85 to 100 feet thick, is overlain by dark gray dolomitic limestone and dolomite. DSlm: The early Devonian to late Silurian Lone Mountain Dolomite, which has its type locality at Lone Mountain. It's a light gray to medium gray dolomite, is about 1570 feet thick, and has gradational contacts at its base and top. Dn: The Devonian Nevada Formation. This is a formation name that was first used in 1876; the formation was revised many times (see Nolan and others, 1956, and GEOLEX) and was abandonded in 1982 (Hose and others). The name does not have current usage, but it can be found on county maps and is sometimes used for regional mapping. Lithologically, it is composed mostly of dolomite (Nolan et al, 1956). It consists of or is equivalent to several other formations including, in places, the Simonson Dolomite. Dd: The middle to late Devonian Devils Gate Limestone - a limestone that used to be part of the Nevada Formation. 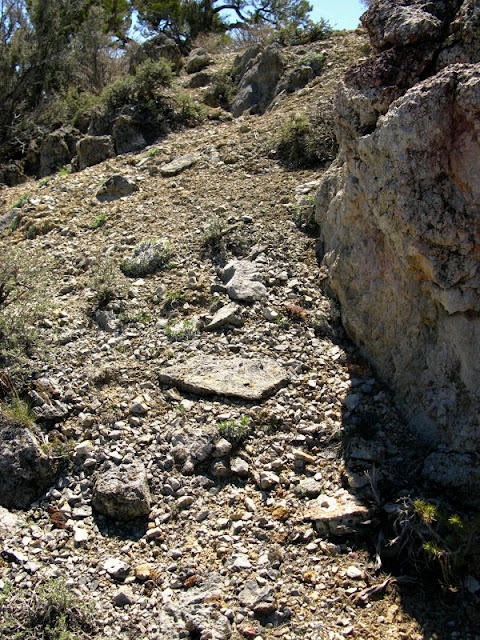 About 1100 feet of Devils Gate Limestone is exposed on the east flank of Lone Mountain. Hose, R. K, Armstrong, A. K., Harris, A. G., and Mamet, B. L., 1982, Devonian and Mississippian rocks of the northern Antelope Range, Eureka County, Nevada: U.S. Geol. Survery Prof. Paper 1182, 19 pages. Merriam, C. W., 1940, Devonian stratigraphy and paleontology of the Roberts Mountains region, Nevada: Geol. Soc. America Special Paper 25. 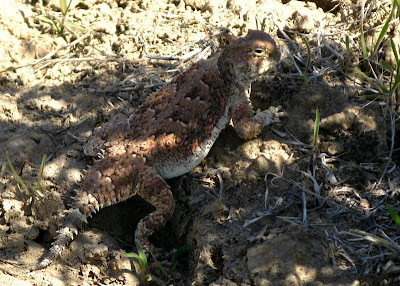 Lizards, of the type variably called horned lizards, horned toads, or horny toads [that's how I've always heard it!] were out sunning when MOH and I stopped at our central Nevada hiking spot while traversing Highway 50 the other day. I photographed two, though there were others I missed. This one was first resting in a spot on the trail to the Cold Springs Pony Express Station. 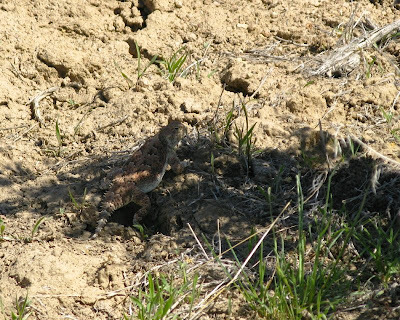 As soon as we approached, it ran off to blend into the shadows under a sagebrush. 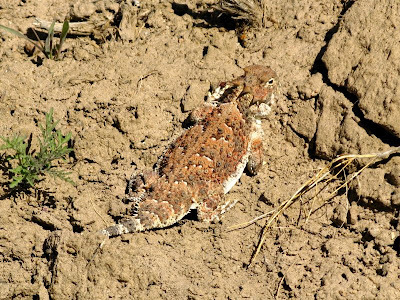 Horned toads are of the species Phrynosoma; this one, with three large horns at the back of its head, is probably a Phrynosoma platyrhinos. He(?) kept one eye on me almost all the time. After hiding under the bush, he ran out into the middle of a relatively unvegetated area (dirt) and froze, flattening his body against the ground as a way of hiding in plain view. He was difficult, indeed, to follow on the viewscreen of my camera. One last view before our horny toad runs under another bush. 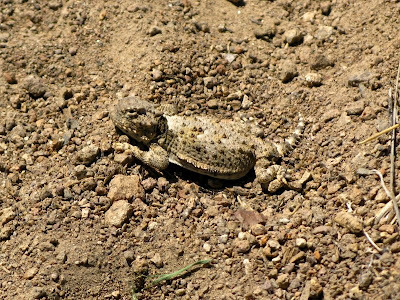 And here's a small horned lizard - I think this is the same kind as above, but a youngster! 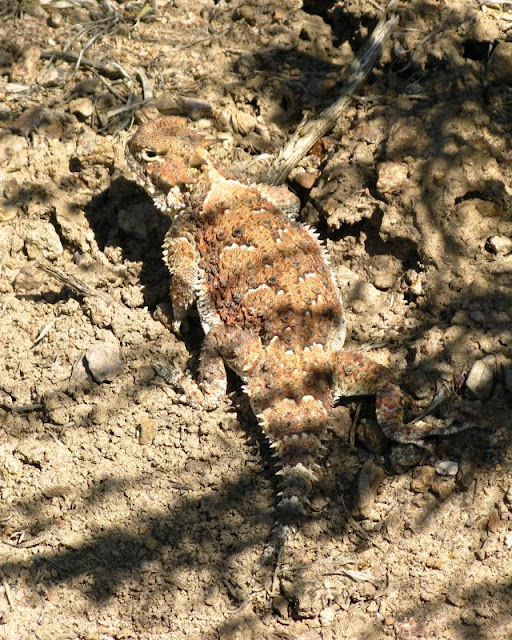 Horned lizards have their very own conservation society: Phrynosoma.Org. This post is an entry in the Carnival of the Arid #4, hosted by Chris Clarke at Coyote Crossing. Just a few more flower photos from recent hikes for weekend enjoyment. First, one of my favorite flowers on the hill so far, above, the same bright red Indian paintbrush seen a few days ago. Photo: April 20th. 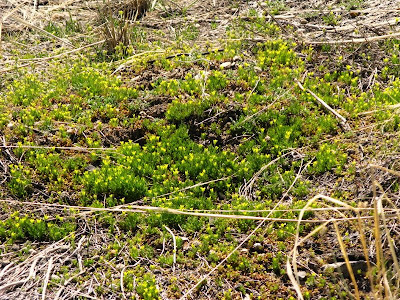 Above, some of the tiny yellow flowers, April 20th, growing around the rusted cans of an archaeological site near some old mine dumps (date of cans unknown). These yellow flowers are the same ones, seen in an earlier post, that were in full bloom lower on the hill on April 12th. Two days later, on April 22nd, these flowers have faded with time and the graying of a cloudy day, and are starting to go to seed. 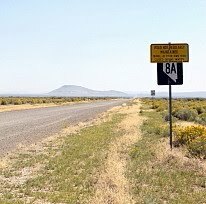 As you may remember, a short time ago we were sitting alongside Highway 50 in central Nevada, looking north at Lone Mountain (map). The reason we were doing that - besides the fact that Lone Mountain breaks up an otherwise long stretch of Highway 50 between Austin and Eureka - is because Lone Mountain provides a good exposure of a portion of the Ordovician through Devonian stratigraphy typical of eastern facies rocks in central Nevada. “Eastern facies” refers to rocks in the lower plate of the Roberts Mountains thrust, a regional thrust that formed during the late Devonian to Mississippian Antler Orogeny (300-375 Ma or 380 Ma). During the Antler Orogeny, western facies (eugeoclinal) Ordovician siliceous rocks (mostly cherts and black shales with minor greenstones) were thrust over eastern facies (miogeoclinal) Cambrian through Devonian carbonate rocks along the Roberts Mountains thrust (Merriam and Anderson, 1942). Mississippian paleogeography, showing the Antler highland and foredeep. <-----The Roberts Mountains thrust is sometimes erroneously called "Roberts Mountain thrust" (after Roberts Creek Mountain??) and is also sometimes erroneously shortened to "Roberts thrust." The latter name is presumably in reference to Ralph Roberts, who worked extensively in the area mapping the formations and the thrust and naming the Antler orogeny (Roberts, 1949; Roberts, 1964). He is often known as the father of the Carlin Trend for defining the Carlin Trend and the Battle Mountain-Cortez-Eureka Trend and for telling everyone where to find gold in the region (Roberts, 1960; Roberts, 1986). The eastern and western facies units, and the Roberts Mountains thrust itself, were then partly covered by a Mississippian through Permian overlap sequence of shallow-water carbonate and siliclastic rocks. All three facies or sequences – western, eastern, and overlap – occur at Lone Mountain; the eastern facies dominates, with western and overlap sequence rocks occuring only in low-lying pediment areas south and east of the mountain. One summary of major geologic events in Nevada. Geotectonic evolution of the Great Basin - Dickinson, 2006 - see Figure 2, page 355: A time-space diagram of lithic assemblages in the Great Basin and adjoining areas. Merriam, C. W., and Anderson, C. A., 1942, Reconnaissance survey of the Roberts Mountains, Nevada: Geol. Soc. America Bulletin, v. 53, no. 12, p. 1675-1728. Roberts, R. J. 1949, Geology of the Antler Peak quadrangle, Nevada: U.S. Geol. Survey Open-File Rept 49-47, 108 pages (superceded). Roberts, R. J. 1960, Alignment of mining districts in north-central Nevada: U.S. Geol. Survey Prof. Paper 400-B, p. 17-19. Roberts, R. J., 1964, Stratigraphy and structure of the Antler Peak Quadrangle, Humboldt and Lander Counties, Nevada: U.S. Geol. Prof. Paper 459-A, 93 pages. Roberts, R. J., 1986, The Carlin story in Tingley, J. V., and Bonham, H. F., eds., Sediment-hosted precious-metal deposits of northern Nevada: Nevada Bur. Mines and Geol. Report 40, p. 70-80. Speed, R. C., and Sleep, N. H., 1982, Antler orogeny and foreland basin: A model: Geol. Soc. America Bulletin, v. 93, no. 9, p. 815–828. These photos are mostly from two hikes this year, with one photo from last year. I have photographed, repeatedly, one area from very similar angles over the course of the past year or so, and am now comparing flower growth in that area. I've also started to watch flower growth in a second area I started observing earlier this month. Rocky hillside on April 12th, 2009. 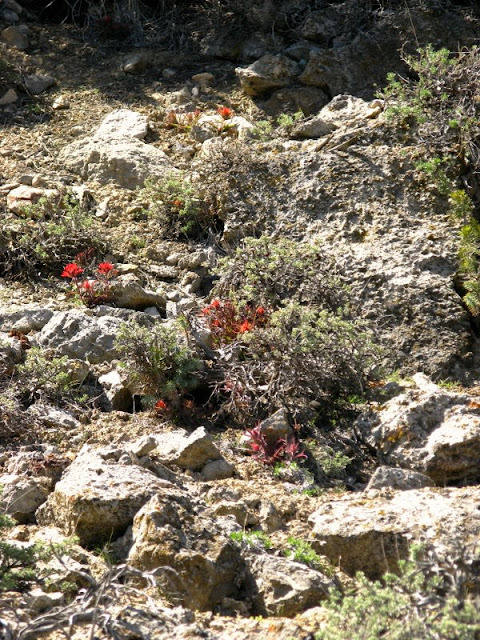 The reddish clump near the rock face in shadow, and above and to the right of the flat, squarish rock in the center of the photo, is the only Indian paintbrush clump in the photo. It was seen, enlarged, in yesterday's post. Rocky hillside on April 20th, 2009. 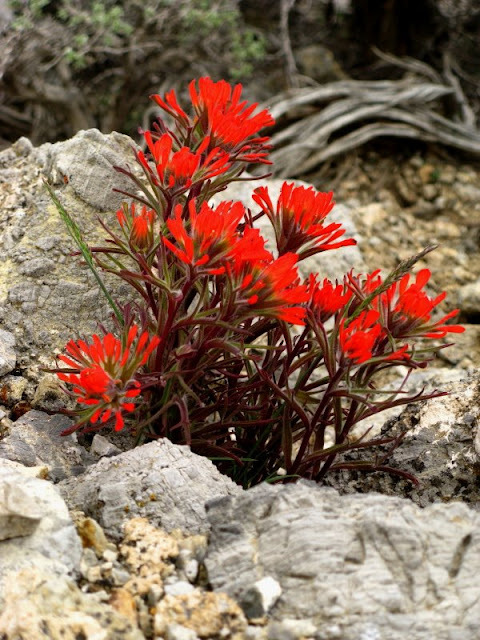 The reddish Indian paintbrush clump has grown some, as have green clumps of next month's yellow flowers. 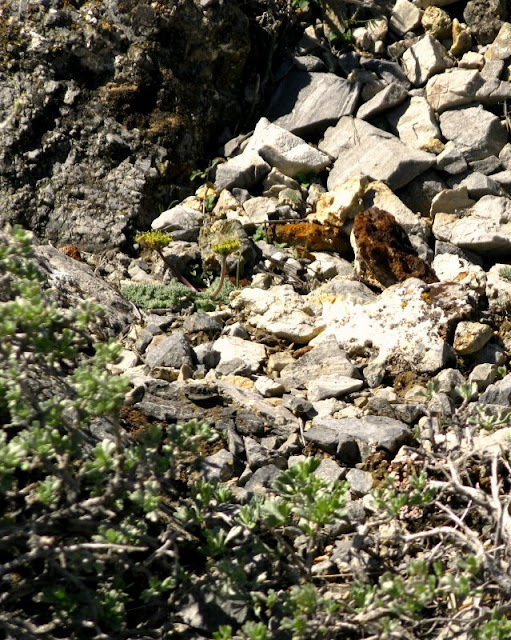 For comparison, the same rocky hillside on May 25th, 2008 - one month less than one year ago - with the red Indian paintbrush blooming, and many clumps of yellow flowers in bloom. Here, I've enlarged the April 12th, 2009, photo of the same hillside, to compare with an enlargement from April 20th, 2009, below. You can see more clearly, with the above two sets of photos, that the reddish Indian paintbrush clump and the other green clumps have all grown some during 8 days time, though they are not ready to bloom. 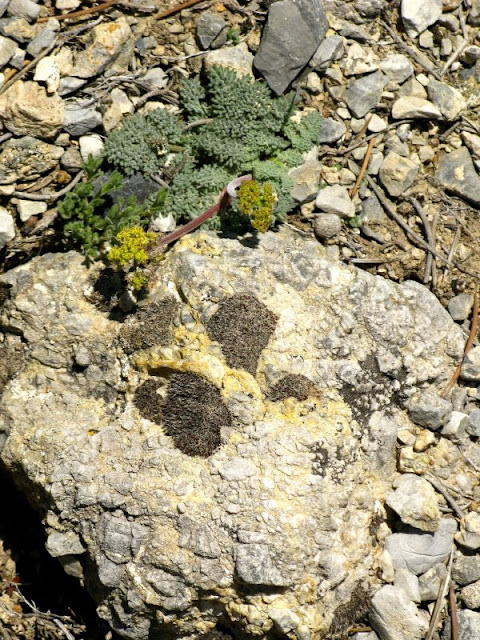 In addition, a small Eriogonum, Lomatium, or Cymopterus has appeared in the lower left near the two large rocks (see enlargement below). 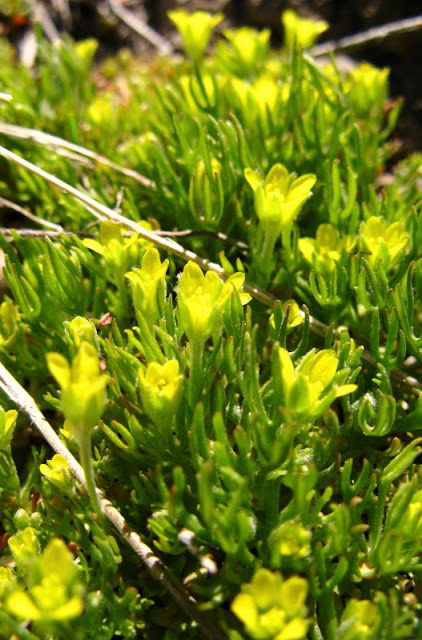 Tiny plant with yellow flowers, enlarged, above bush and near two small brown rocks (see earlier post and comments for discussion of plant ID). 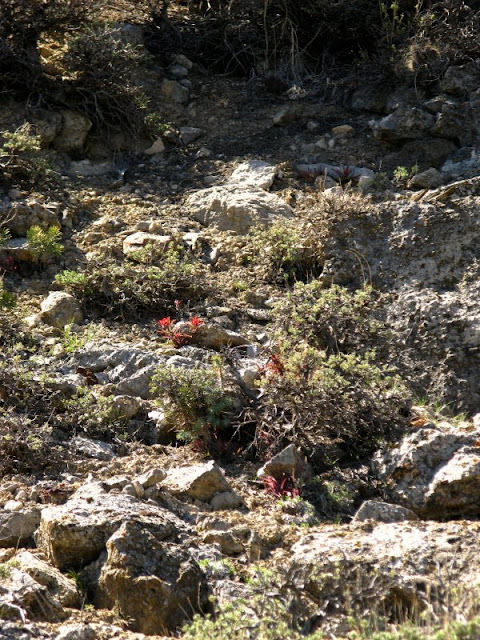 Above, a photo from April 12th, 2009, on a lower slope, with one Indian paintbrush blooming well, and a few others starting, though the others are hard to see until you look at the next photo. 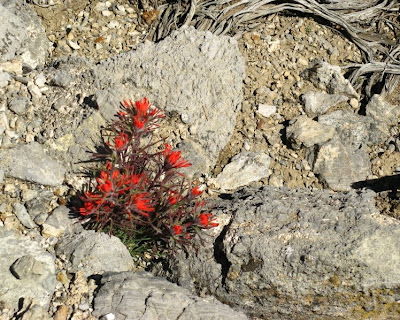 The same area on April, 20th, 2009, with many Indian paintbrush plants obvious. Recent Hikes: Spring Flowers - and Butterfly! Wildflowers have been starting to come up this month, as evidenced by two fairly recent hikes we took, the first one on April 12th, the second one on April 20th. But first: a butterfly. 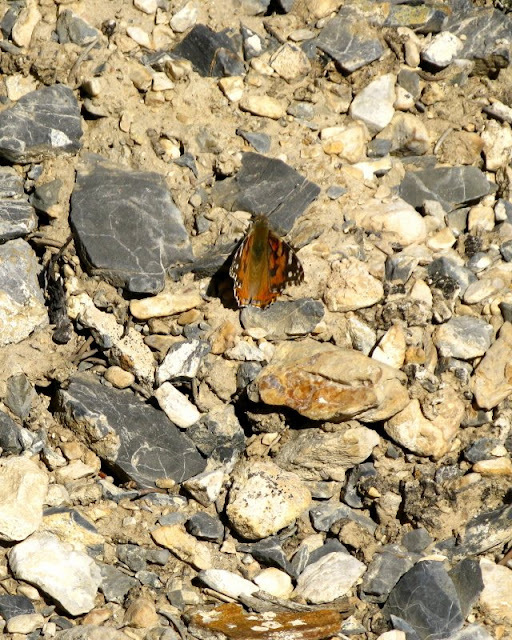 This is a Painted Lady, the first butterfly (Papilionoidea) I saw this year, from our April 12th hike. Skippers (Hesperoidea) were out on some hikes prior to April 12th, but no butterflies. By April 20th, white cabbage butterflies were also flitting about. The April 12th hike didn't show us very many types of wildflowers; this was the only one blooming, a very small mat of green leaves with yellow flowers, which we saw here and there on warm, lower slopes. An enlargement of the tiny yellow flowers, with pine needles for scale. These flowers had all gone to seed by April 20th, and the green was starting to fade. UPDATE: These are probably Ceratocephala testiculata, see comments below. 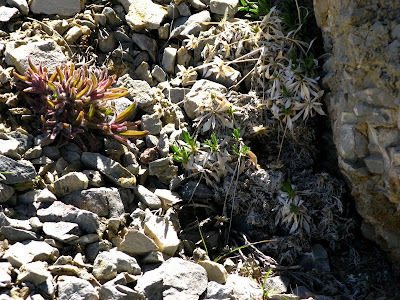 On April 12th, paintbrush - the reddish stalks and leaves - were just starting to come up, as were some tiny, green shoots of a yellow flower, not yet in bloom next to the rock outcrop. Neither of these particular clumps were blooming on April 20th, but they had grown slightly (see next post). 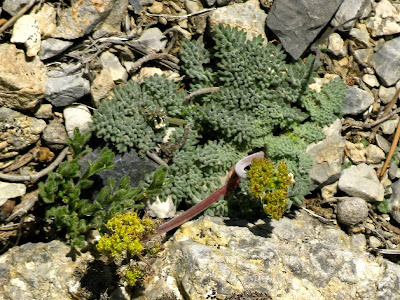 Our April 20th hike revealed a few more flowers, including this mostly budding, barely blooming yellow flower - probably an Eriogonum, or buckwheat, possibly this one. UPDATE: This is more likely a Lomatium or Cymopterus, see comments below. A closer view. These tiny plants were just starting to come out. 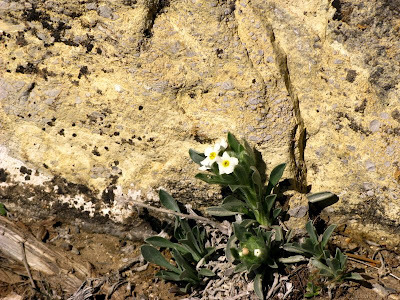 A probable Cryptantha, or borage, possibly this one - against a limestone breccia. 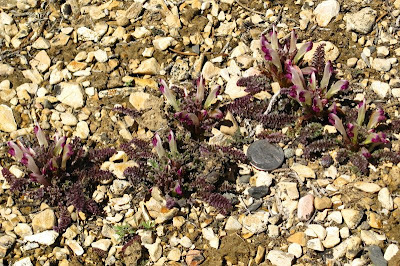 The upper slopes were covered with these tiny purple and white flowers, tinged with light green. Note quarter for scale. 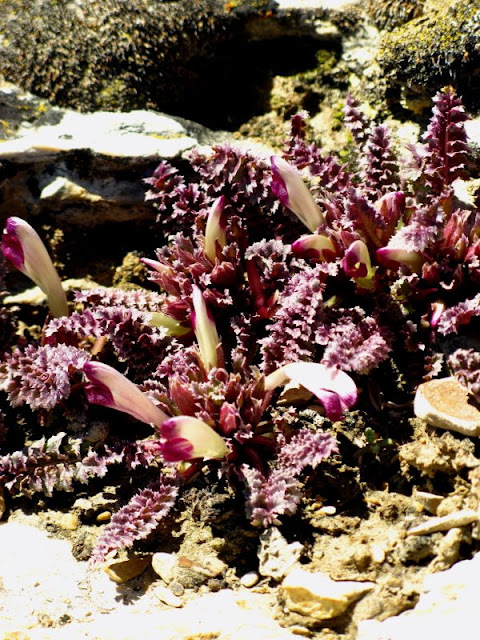 These are Pedicularis centranthera, or dwarf lousewort, described here. I've not really noticed these flowers before. Down on the lower slopes, red Indian paintbrush, Castilleja, was getting fairly well into bloom, and maybe - just maybe - some lupine will be out soon. 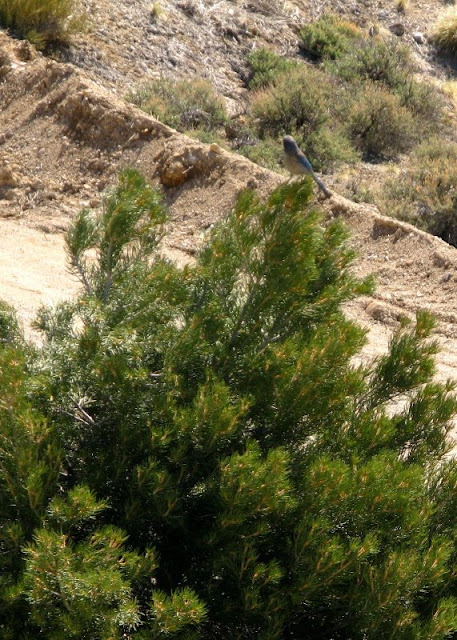 Pinyon jay in piñon pine tree. Raven with Wheeler Peak in the background. 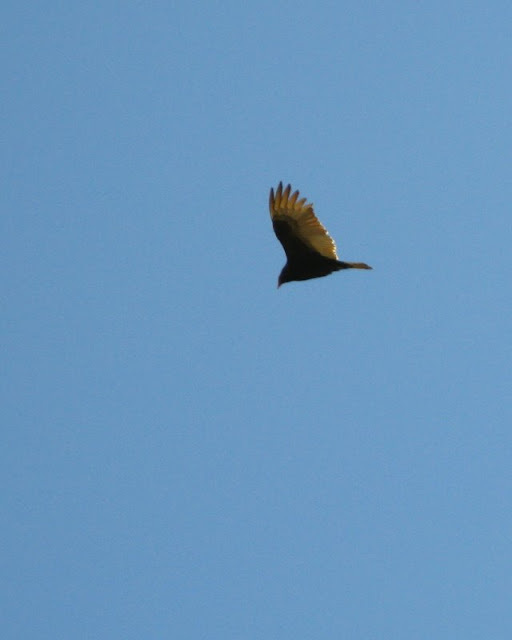 Turkey vulture hovering overhead, almost buzzing us. Did we look tasty? My blog posting has been going rather slowly these days, compared to an average of about one-per day back in January. I'm going to blame that on micro-blogging, at least for now. And what are the effects? Well, check this out! When I had this website evaluated by stimater.com in early February, it was worth $25,401! The lesson here? Buy this site now before the price goes back up! First seen at Oustside the Interzone back in February. Warning, I had to do fairly major html changes to make their little badge thingy work properly. Lone Mountain, in Eureka County, central Nevada, is the site of a fantastic stratigraphic section of Ordovician and Devonian rocks. 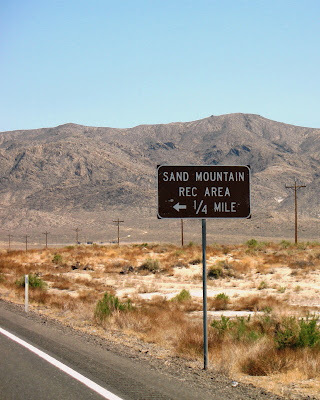 First of all, though, let's get our names straight: there are three, count 'em, three Lone Mountains in Nevada. 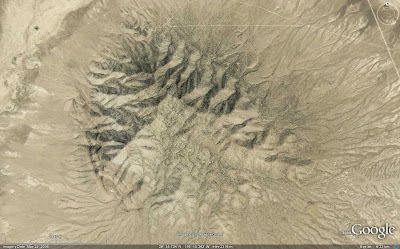 The second Lone Mountain is near Tonopah; the third is near Las Vegas. We won't, however, be discussing those other two Lone Mountains right now. Our Lone Mountain is located here (MSRMaps location). Also, click this enlarged air-photo view: Lone Mountain is semi-circular in form, although I don't have the vaguest idea why. Most importantly for our stratigraphic interests, Lone Mountain is less than 50 miles from Eureka, Nevada - the county seat of Eureka, County, and a bustling speed trap - placing it within the original type area of the Eureka Quartzite as defined by Hague in 1883. 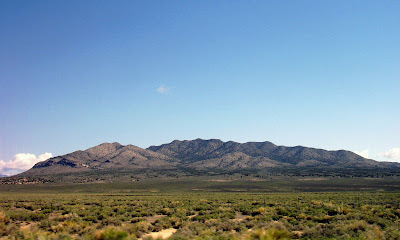 Lone Mountain is north of Highway 50, and can be accessed via several 2WD and 4WD dirt roads. 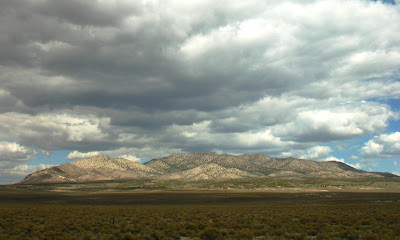 A good viewing point is from the Antelope Valley road, a major graded dirt road going south from Highway 50 toward the Antelope Range. Do not pull out onto this road when it is excessively muddy! Hague, Arnold, 1883, Abstract of report on the geology of the Eureka district, Nevada: U. S. Geol. Survey 3d Ann. Rept., p. 237-272. Update from the Lake: Buds and Birds and Flowers and Trees! This is perhaps a more typical spring update from the lake, as compared to the last update. Last weekend we saw a few more hints of spring appearing here and there, although the grape hyacinths still weren't blooming. 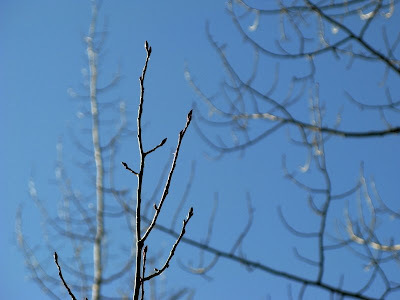 A few tiny buds were appearing on some of the aspen trees in the backyard. 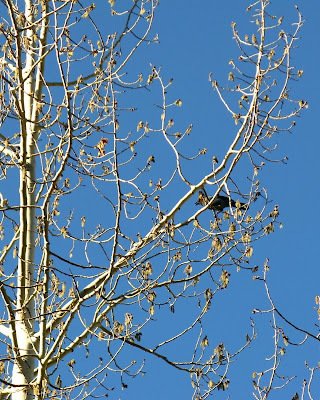 Other aspen trees were adorned by catkins - possibly of the male variety, as seen in a closeup on Kim's blog - and by a scrub jay hopping from branch to branch. 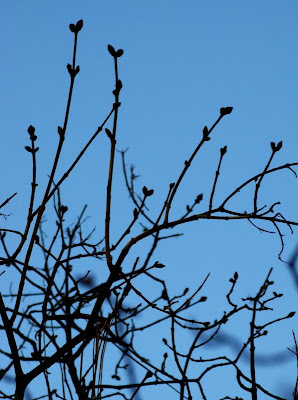 Buds on our lilac bushes were just coming out. 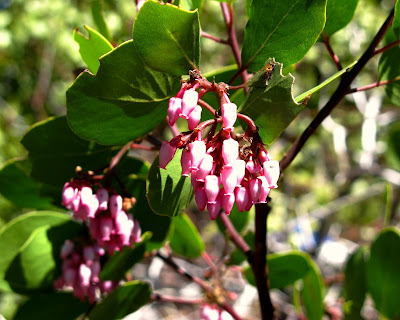 The only flowers in our yard were on manzanita bushes. 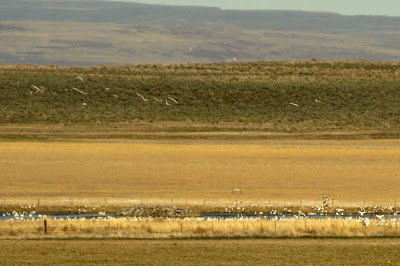 When we drove past Honey Lake last Monday, snow geese were still hanging out in the same place, a little farther from the road in a patch of water, and not quite so picturesque or scenic looking. This flock of geese has been present in this particular area from at least April 3rd to April 6th this year. I don't know what their usual time frame for hanging around is, but I will be looking carefully henceforth! One year ago today, while out mapping some scrabbly slopes near Yerington, I came across this lizard, sunning itself on some skarn. 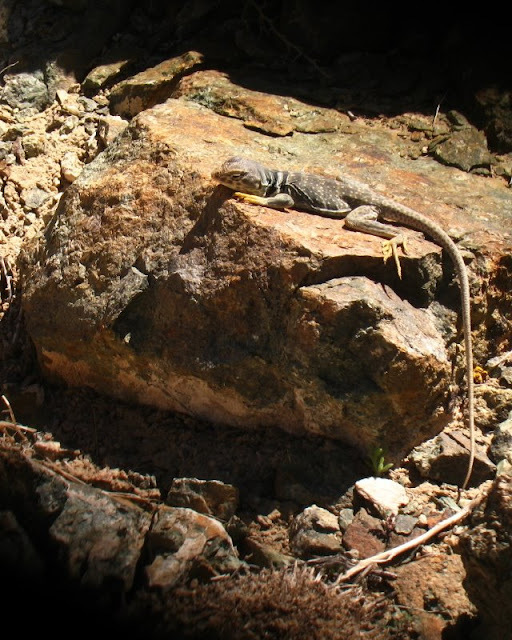 This lizard has yellow feet, a black-white-black neck band, brown and black bands on its back with white spots, and brown spots on its tail. If anyone knows what kind of lizard this is, please post in the comments. Thanks! The mountain mahogony, this particular one first seen here, is a wonderful tree common at higher elevations in Nevada and other parts of the intermountain west, often in areas just below tree line. 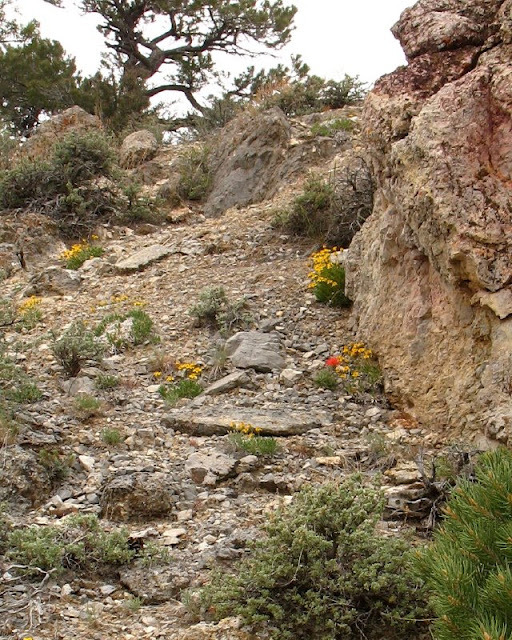 It's plant-association range in Nevada is from the upper sagebrush zone into the piñon-juniper zone to just below tree line, sometimes with limber pine and other high-elevation trees. 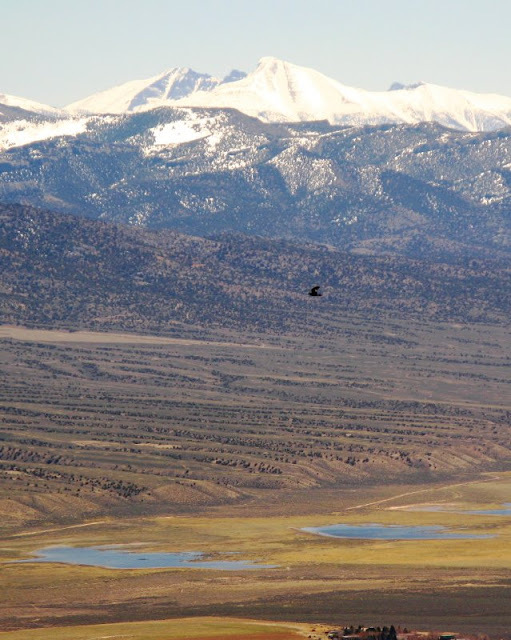 Elevation range in Nevada is commonly from 1200 to 2700 m (3900 to 8850 ft), but it can be found as high as 3050 m (10,000 ft). I first really noticed mountain mahogany while working out in the field one summer in the Deer Lodge or Stateline mining district, a silver-gold district located on the Nevada-Utah state line, due east of Pioche. 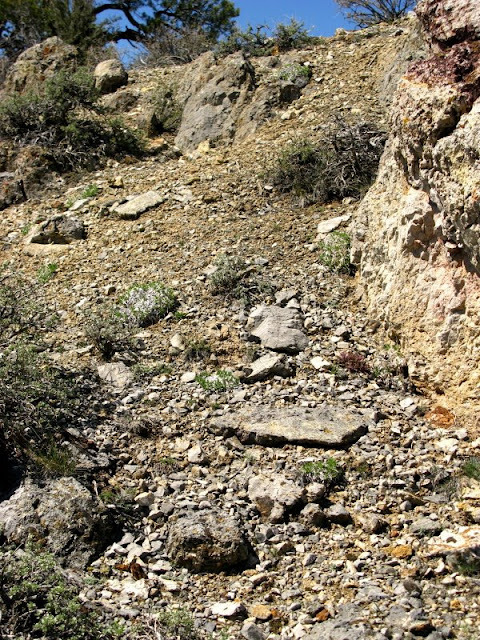 At Stateline, silver and gold occur in quartz veins in Tertiary volcanic rocks - rhyolite and andesite - and particular quartz veins in the area contained the first chlorargyrite I ever saw in real life, outside a mineral collections or museums. Chlorargyrite, sometimes called cerargyrite, is a somewhat rare silver-chloride mineral formed through supergene processes. It was still early in the summer when we arrived, having moved north from our previous camp south of Caliente. 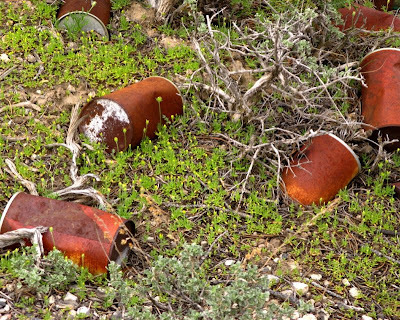 A crew-leader had already found some uranium and the company had already staked a small number of claims. 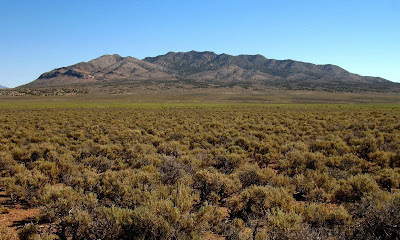 I was briefly involved in the claim staking, which meant I was running lines in rocky terrain through dense underbrush that was composed mainly of mountain mahogany bushes and trees, although I didn't know it at the time because I was so involved in keeping the lines straight with Brunton compass foresights and backsights. Later, a real claim staking crew came in and re-surveyed our claims while staking more. The uranium occurence was found from the air, by helicopter, using a spectrometer that measured U, Th, K, and total counts. The occurrence was centered on one claim owned by an individual prospector, with the anomalous uranium contained in a mysterious high-level, quartz-eye rhyolite intruding a Tertiary volcanic pile of ash-flow tuffs and flow-dome complexes. The intrusive was limited in its known surface extent, and we wanted to find more of it. We set about geologic mapping, four young geologists driving to the property from camp every day in one half-ton, four-wheel-drive pickup, over rocky dirt roads that made our front-seat crowding almost unbearable. Sometimes we could get a Las Vegas rock-and-roll radio station part way up the mountain for driving entertainment, sometimes not. The mountain mahoganies were concentrated especially on a northwest- to north-trending ridge line just barely inside the Nevada border. I especially remember the long, north-trending part of the ridge, where the patches of mountain mahogany seemed especially dense, and where the ridge was underlain by flow-banded rhyolite weathering into thin, shaly-looking chips. I walked up and down and across that ridge numerous times, around and under many scrubby to standing-tall mountain mahoganies, over and across outcrops and subcrops of pinkish rhyolite. I developed an association between the scent of mountain mahogany - distinctive everywhere across its range - and flow-banded rhyolite. For years, anytime I would catch that scent on the wind, especially on hot summer days, I'd automatically start looking for rhyolite. 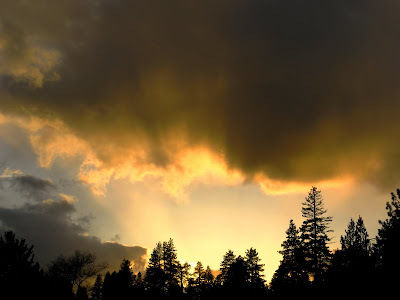 I wonder if the same thing would happen now, if I went back to the source of the association, back to that long ridge high above Deer Lodge Canyon. Stotebury, H. W., 1921, Report on the Stateline Mining District, Iron Co., Utah, Lincoln, Co., Nevada: scanned by Nevada Bureua of Mines and Geology, 9 pages. 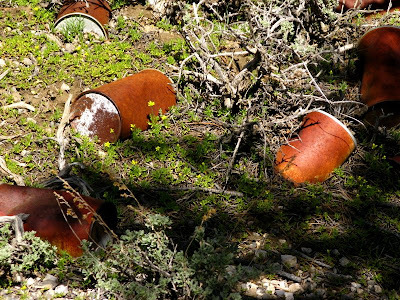 Location: T. 1 N., R. 71 E.; near the summit of the high peak at the head of Deer Lodge Canyon. Radioactivity: Background = 0.02 mR/hr. ; High = 0.20 mR/hr. One sample contained 0.58 percent cU30s (but only 0.12 percent eU308). Geology: Autunite and torbernite occur in 1- to 2-inch siliceous stringers in a white to gray rhyolite flow. Some iron-oxide staining [hematite] is present. References: U. S. Atomic Energy Comm. Prelim. Reconn. Rept. 3535; Tschanz and Pampeyan, 1969.
from Garside, L. J., 1973, Radioactive mineral occurrences in Nevada: Nevada Bureau of Mines and Geology Bull. 81, page 73. 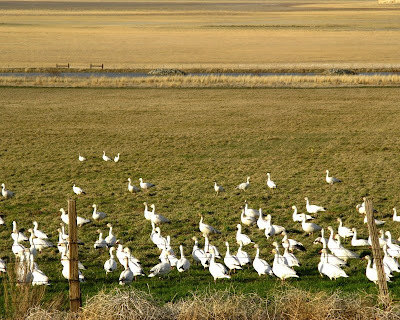 I hadn't planned on making a Honey Lake update so soon after the last one, but as MOH and I were driving by Friday we came across this huge herd flock of snow geese, which looked like a mass of little tiny sheep, until we got closer. 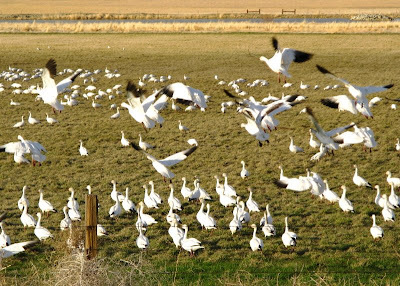 Snow geese are known to winter in the area or region, though I've never seen them before. Turns out they had gathered themselves together in almost the exact place I took a couple photos for my last Honey Lake update, right in front of the place I call "the bluff," near The Island, south of Milford. Looking closely, past the geese and to the watery place to the left of the bluff, it looks like the water is a bit lower than it was about two weeks ago (photos for the March 29 post were taken on March 20 and 21). 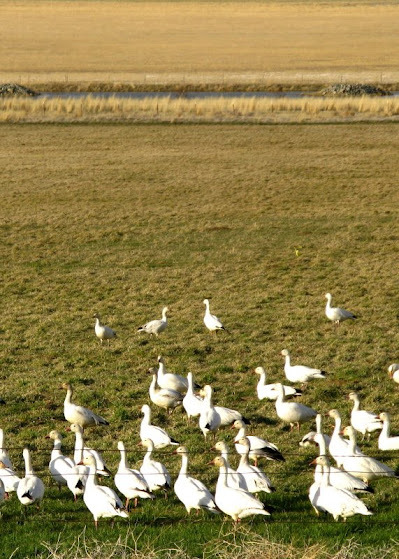 Some of the snow geese show rust-stained heads, which is at least sometimes common, according to the Peterson Field Guide. 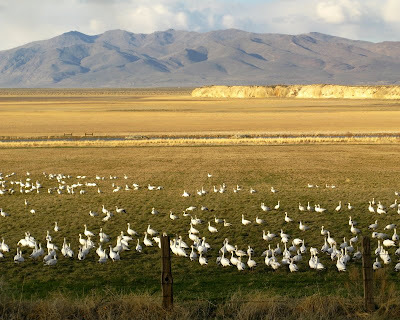 They are all just standing around, munching on grass, doing what geese do, on the other side of the fence along Highway 395 between Reno and Susanville. 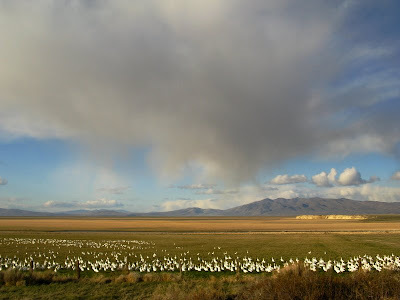 Enlarged version of snow geese! 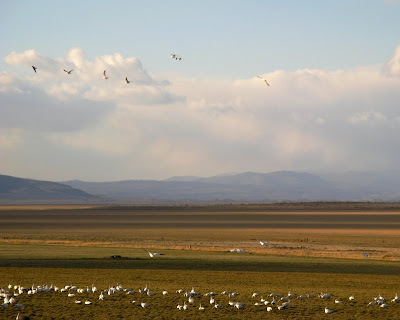 Snow geese flying, because of our proximity. We parked the Prius on the side of the road right next to the roadside fence. The geese show their distinctive black-tipped wings, and their even more distinctive "grinning black lips" - a thin black line on their orange beaks. And we drive away, still having at least a few miles to go. Carnival of the Arid #3 is Up!